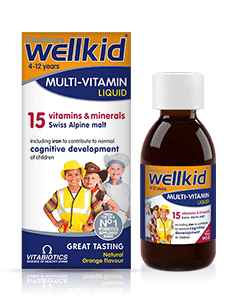 Wellkid Multi-vitamin Liquid has been produced with children's specific needs in mind to provide a comprehensive range of 15 nutrients, plus Swiss Alpine malt to help safeguard your child's nutritional intake. It comes in a great tasting natural orange flavour that kids will love. 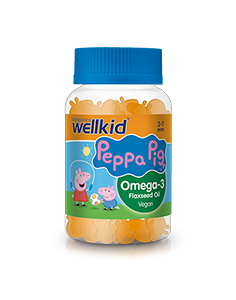 Wellkid Multi-vitamin Liquid includes vitamins A, C and D, as recommended by the UK Department of Health which advises that all children up to the age of 5 years should be given a supplement that contains these vitamins. Growth is especially rapid during the first 12 years of a child's life. Continuous development of bones, muscles, blood and the brain mean that children have a high nutrient requirement compared to their body size. Meeting those nutritional requirements can be a challenge, as it is common for children to be fussy eaters. You may experience your child refusing to eat certain foods, disliking certain tastes or textures, or being reluctant to try new foods. 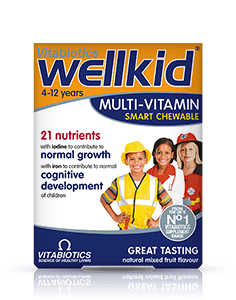 Children usually grow out of fussy eating and in the meantime nutritional supplements such as Wellkid Multi-vitamin Liquid can help safeguard a child's nutritional intake as part of a balanced diet. Government surveys have indicated that children's diets can be low in certain nutrients such as iron, which contributes to normal cognitive development of children. This is especially true for vegetarians, as iron from non-meat sources may not be as easily absorbed by the body. 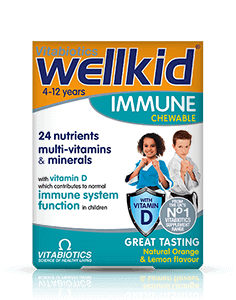 Wellkid Multi-vitamin Liquid is formulated with moderate levels of iron and is suitable for vegetarians. 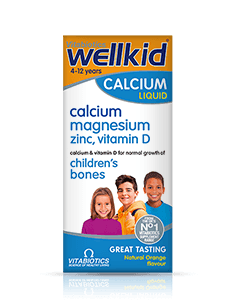 Wellkid Multi-vitamin Liquid is formulated with iodine which contributes to normal growth in children, plus vitamin D. Vitamin D is needed for normal growth and development of bones in children. It also contributes to their normal immune system function. The UK Department of Health recommends all children aged up to 5 years should consider taking a daily Vitamin D supplement. 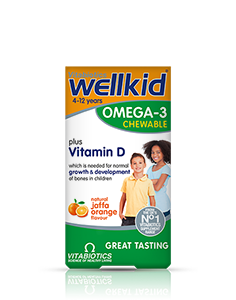 The vitamin D in Wellkid Multi-vitamin Liquid is included in the preferred vitamin D3 form (cholecalciferol) that is naturally produced by the skin when exposed to direct sunlight. (Source: NHS Choices). Its formula is based in the very latest scientific research, with nutrient levels carefully optimised with children's specific needs in mind. Wellkid Multi-vitamin Liquid is produced to high GMP (Good Manufacturing Practice) standards of quality control. 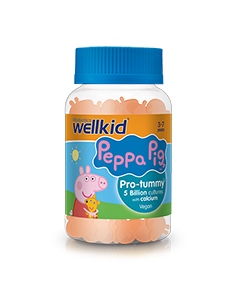 Wellkid Multi-vitamin Liquid has not been tested on animals. 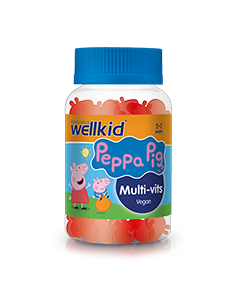 Wellkid Multi-vitamin Liquid is available from Boots, independent pharmacies and health stores. Alternatively you can order online here. Vitamin and mineral liquid with malt extract, for children aged 4-12 years. Purified Water, Raw Cane Sugar, Malt Extract (from Barley), Glucose Liquid (Sulphur Dioxide), Ferric Ammonium Citrate, Zinc Sulphate, Vitamin C (Ascorbic Acid), Stabiliser: Xanthan Gum, Preservative: Potassium Sorbate, Natural Flavouring (Orange Ext. ), Niacin (as Nicotinamide), Vitamin E (DL-Alpha Tocopheryl Acetate), Acidity Regulators: Citric Acid & Sodium Hydroxide, Pantothenic Acid (D-Panthenol), Vitamin B2 (Riboflavin 5-Phosphate Sodium), Thiamin (Vitamin B1 as Hydrochloride), Vitamin B6 (Pyridoxine HCl), Copper Sulphate, Vitamin A (as Palmitate [Antioxidant: DL-Alpha Tocopherol]), Folic Acid (as Pteroylmonoglutamic Acid), Potassium Iodide, Vitamin D3 (Cholecalciferol), Vitamin B12 (Cyanocobalamin). Allergy Advice: For allergens, see ingredients in bold. SHAKE WELL BEFORE USE. GIVE TO YOUR CHILD ORALLY, AS BELOW. Some natural change in colour may occur after opening. Do not exceed the recommended intake. Measuring spoon included. Wash and dry the spoon thoroughly after use (not in a steam steriliser). Do not use if the bottle seal is broken on purchase. Store in fridge after opening and use within 6 weeks. Food supplements must not replace a varied balanced diet and a healthy lifestyle. As with other food supplements, seek professional advice if your child is under medical supervision, have epilepsy, a thyroid disorder, suffers from food allergies, or are allergic to any of the ingredients. This product contains iron, which, if taken in excess, may be harmful to very young children. Any spillage should be wiped off your child's skin. How long does one bottle of Wellkid Multi-vitamin Liquid last? How and when should Wellkid Multi-vitamin Liquid be taken? 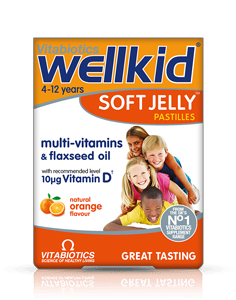 Are there any undesired effects whilst taking Wellkid Multi-vitamin Liquid? 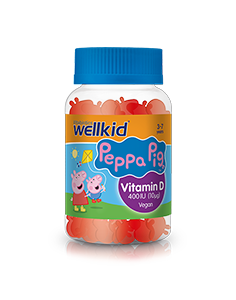 Is Wellkid Multi-vitamin Liquid recommended with any other Vitabiotics products? Is Wellkid Multi-vitamin Liquid suitable for vegetarians? Has Wellkid Multi-vitamin Liquid been tested on animals? Sometimes Nutrient Reference Value (NRV) levels are above 100%, is this safe? Calcium is an essential mineral, needed for normal growth and development of bone in children. However, it has not been included in the Wellkid Multi-vitamin Liquid formula, as it is not possible to include the right amount in one dose. Certain vitamins are very safe at levels tens or even hundreds of times the NRV, whereas for others the safety level is much closer to the NRV. For this reason every vitamin and mineral needs to considered on an individual basis in terms of its upper safe level. The Nutrient Reference Value (NRV) is the amount of a vitamin or mineral which has been calculated to help prevent basic deficiency states in the general population. However, certain vitamins and minerals at optimal levels, above the NRV, have consistently been shown to have positive benefits in specific areas of health. This is why some Vitabiotics formulas have certain nutrient levels greater than 100% NRV. Food supplements must not replace a varied balanced diet and a healthy lifestyle. As with other food supplements, seek professional advice if your child is under medical supervision or suffers from food allergies. This product contains iron, which, if taken in excess, may be harmful to very young children. Any spillage should be wiped off your child's skin.